You have the choice of five different accommodation types at luxurious Buitenhof Domburg, ranging from a standard villa to luxurious thatched country houses, with room for 6 to 16 people. For example, there is a detached 6-person standard villa with three bedrooms (NL-4357-24). There is also a 7-person luxurious and child-friendly detached, thatched villa (NL-4357-25). This type is luxuriously furnished and has two bathrooms, one with a hot tub. It has a separate children's room with a child's bed, bath and changing table. There is also a high-chair and playpen, a stair guard upstairs, a toy wagon, a washing machine and a fenced garden. For big families or multiple families travelling together there is the 8-person detached, luxurious, thatched country house (NL-4357-26). This type has heated floors on the ground floor, four bedrooms and two bathrooms, one with a hot tub. 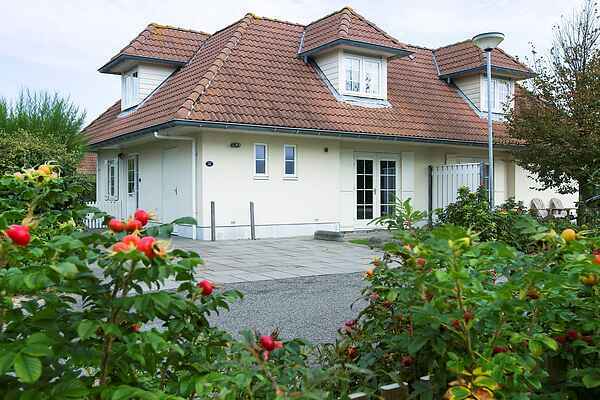 But there is something even bigger: the link-detached 10-person thatched duplex country house (NL-4357-27). This house has four bedrooms and two bathrooms, one with a private sauna. Ideal for a stay with friends or family. The biggest variant is the detached, luxurious 16-person thatched family villa (NL-4357-28). This spacious villa is furnished in a luxurious and very child-friendly design. It contains eight bedrooms and three bathrooms. There is a washing machine and dryer, as well as two child plus packages: a child's bed, a high-chair, covered wall sockets, a stair guard upstairs, a fenced garden, a sandbox in the garden and a toy wagon. All villas and country houses have a garden with a terrace and garden furniture. You can generally park right at the accommodation.